Thank you for including occupational therapy in your giving plans. Please contact us directly if you have a special purpose in mind and we will be happy to facilitate your wishes. We all know the value of investing in the next generation of health professionals and researchers. Trainee awards and bursaries give us the opportunity to recognize emerging talent and encourage deserving individuals to pursue their passion for improving health. The UBC Faculty of Medicine will match all gifts made by August 31, 2018, to the Building the Future Awards & Bursaries campaign (up to $5000). This campaign is working toward ensuring a sustainable source of support for the Department of Occupational Science & Occupational Therapy’s innovators and lifelong learners. Please donate to the Building the Future campaign online. This fund supports occupational science and occupational therapy research projects conducted by graduate students and faculty. By supporting innovative pilot projects that don’t fit specifically within existing funding agency frameworks, we anticipate building capacity to attract significant funding through larger health granting opportunities. Your gift helps us lay the groundwork for excellence in OSOT research and advancements in practice. Donate now. This fund supports initiatives that bridge the gap between research and practice, policy, or other forms of community impact. When faculty and graduate students work on campus, in hospitals, or in the community, they want to ensure that the new evidence, knowledge, and ideas they generate helps to shape the world around them. By donating to the knowledge translation fund, you enable OSOT research to expand and amplify its sphere of influence. Donate now. Dr. Margaret Hood was the first OT instructor at UBC in 1961. 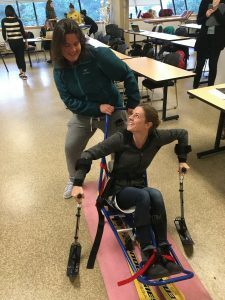 In honour of her tremendous contributions to the development of the Rehabilitation Sciences and Occupational Therapy programs at UBC, alumni from these programs have made gifts to support a scholarship for a superior graduate student in Occupational Therapy. The scholarship assists exceptional students by providing both financial support and recognition of their academic achievements. Donate now. Until 1981, students in the Bachelor of Science in Rehabilitation program received a stipend from the Province for clinical work in the hospitals. In 1982, however, the province discontinued the clinical stipend for Rehab students, making it more difficult for students in this demanding program to manage the costs of pursuing their education. The BSR Class of 1982, led by RMUS President Nancy Cho (now a physical therapist practice leader in Vancouver) raised money for an endowed bursary, to support students in financial need. Over the past 30 years, the bursary has distributed over $60,000 to 48 students in both occupational therapy and physical therapy. Donate now. Gifts in this category help us upgrade student learning resources, classroom technology, therapy equipment, and emerging fieldwork placement opportunities. Donate now.